Climate change is an important global issue that poses challenges to many facets of our society, and, as such, the groups that examine these issues must be multifaceted. The Northern Climate ExChange, run by the Yukon Research Centre of Yukon College, conducts and promotes research to provide education and solutions to adapt to a changing world. Visit the Northern Climate ExChange website. Hydroelectric power is the Yukon’s main energy source, and the ability to study hydrology of the Yukon River and forecast potential power generation enables enhanced planning of energy resources. The alternative when hydro power is not available is burning fossil fuels, which is comparatively expensive and polluting. 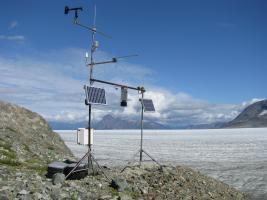 The effects of climate change on the hydrology of the Yukon River headwaters can be better understood by studying data collected via remote meteorological stations. Studying this data will also allow for better utilization of hydro-electric power. The key measurement required is snow-water equivalent (SWE) because the water released from snowpacks and river ice in springtime, or “spring freshet,” is the primary source of water for the dams. The Campbell Scientific CS725 Snow Water Equivalent Sensor uses a non-contact method to measure SWE and is ideal for this application. It measures SWE by detecting the attenuation of naturally occurring electromagnetic energy from the ground. The attenuation of energy is only caused by water in any form, no matter whether it is light powder snow, dense ice, or anything in-between. The previous standard in measuring SWE remotely was the “snow pillow,” which measures the weight of precipitation on a bag of antifreeze. Snow pillows have certain disadvantages in that they modify precipitation accumulation, radiation characteristics, and other factors, which affect the snow pack they are designed to measure. Affecting the snowpack may result in less accurate measurements. The CS725, by virtue of being non-contact, does not suffer from these drawbacks. Yukon College installed a full suite of Campbell Scientific meteorological instrumentation, along with the CS725, at each remote site. Campbell Scientific provides comprehensive meteorological monitoring solutions suitable for harsh, remote environments, various communications options, and data management services. Data collection, hosting, and delivery is provided by Campbell Scientific’s Data Services. An Iridium satellite connection transmits the data where it is stored and monitored at Campbell Scientific’s facility. There the data undergoes Quality Assurance and Quality Control (QA/QC) and is made available to the client via secure web access. With Campbell Scientific’s rugged environmental instrumentation, this project is poised to contribute valuable data for academia and energy policy for many years to come.